Potable water systems use various disinfectants, such as chlorine, to kill viruses and bacteria that otherwise exist in the water and when chlorine reacts with naturally occurring organic matter, it can form disinfection by-products (DBPs) such as trihalomethanes (THM) which are known Cancer Group B carcinogens. The Aqua-Aerobic Systems Aqua-Jet aerator model SS-PW has received NSF 61 approval for potable water applications and offers a lower cost aeration solution for Total THM stripping applications from the perspective of capital, installation and operating cost. Loves Park, Illinois (PRWEB) - Potable water systems use various disinfectants, such as chlorine, to kill viruses and bacteria that otherwise exist in the source water. Disinfection by-products (DBPs) are chemicals formed when disinfectants, largely chlorine, react with naturally occurring organic matter in the water. One type of DBP is trihalomethanes (THM) which represents a group of volatile organic compounds formed by the interaction of organic material in raw source water and free chlorine added for disinfection. The four most common forms of THM are chloroform, bromodichloromethane, dibromochloromethane, and bromoform. These THMs are Cancer Group B carcinogens (shown to cause cancer in laboratory animals). Trichloromethane (chloroform) is by far the most common in most water systems and Dibromochloromethane is the most serious cancer risk, Current regulations limit the concentration of these 4 chemicals added together (total trihalomethane or TTHM levels) to 80 ug/L or .08 mg/L. Removal of Total Trihalomethane (TTHM) is often done through air stripping or aeration which is the process by which water is infused with air to remove volatile compounds like Trihalomethanes (THM). This is a natural technique of keeping water fresh and safe and may be observed in a waterfall or river. The Aqua-Jet can help municipalities comply with the 80 μg/l locational running annual average limit specified in the EPA Stage 2 Disinfectants and Disinfection Byproducts Rule through air stripping. The Aqua-Jet aerator has been approved by UL to meet ANSI/NSF STANDARD 61 requirements for use in potable water applications. The approval includes multiple sizes designated as model SS-PW and can be utilized for TTHM stripping applications or circulation in potable water treatment systems and reservoirs with a minimum volume of 100,000 gallons. The Aqua-Jet aerator model SS-PW offers a lower cost aeration solution for TTHM stripping applications from the perspective of capital, installation and operating cost when compared to diffused aeration or other spray aeration products. 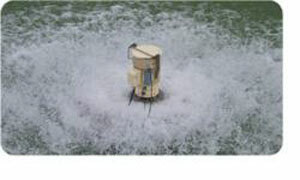 With approximately 80,000 installed units representing over 1.5 million connected horsepower and nearly 9 billion hour of operation, the Aqua-Aerobic Systems Aqua-Jet® surface mechanical aerator may possibly be the most imitated waste water aerator in the world. But, as with other manufactured products, copies never equal the original in terms of reliability and durability. Aqua-Aerobic Systems offers a complete line of cost effective mixing and aeration equipment for both the potable and wastewater market. Our solutions mix and aerate tanks of any size or shape. For more information about the Aqua-Jet or Aqua-Aerobic Systems visit http://www.Aqua-Aerobic.com. Our on line store AquaOnDemand.com features the Aqua-Jet and thousands of other water and wastewater treatment supplies.